Swahili and English are the official languages. Originally from the coastal part, the Swahili is a Bantu language with many words derived from Arabic. Other African languages of Nilotic and Khoisan origin are also spoken. Dry Season : May to October. The warmest months are December to February. Evenings can be cool. Pack one or two sweaters. The rainy season extends into April and May. The critical concentration of rainfall occurs over two months. At that time, the evenings are cool. Pack one or two sweaters. The short rainy season, meanwhile, starts mid-October and goes until early December. Rainfalls just as shorter showers, photographers prefer this season because this wet period has the highest brightness and especially fewer tourists. Pack lightweight cotton and linen, plus a raincoat for the coast and lakeside. Warmer Clothing in June and July for the cool mornings on the coast. Provide one or two sweaters all year long for the safari part. Light clothes almost all year in the mountains. Waterproof advised in April-May. Apart from the coast and Zanzibar, the other locations are in altitude. Evenings and mornings are cool, it is essential to bring a sweater, whatever the season. Sunburns are also guaranteed if you do not take precautions (high protection sunscreen and mosquito net hat against the tsetse flies are very useful). Provide an anti-diarrheal in your medicine kit. Please have also an insecticide and drugs against motion sickness. Finally, do not forget your camera, your sunglasses and a pair of binoculars. Vaccination against yellow fever and the International Vaccinations Booklet are no longer mandatory for entry into Tanzania from EU Zone. Although, if you live in an area at risk (especially the neighboring African countries), they will be asked. Similarly if you do visit the island of Zanzibar after your stay in Tanzania, the vaccine for yellow fever is required. Diphtheria, tetanus, polio, hepatitis A / B and typhoid are recommended. Vaccination against rabies is also recommended. Malaria is endemic in the country. Be sure to protect yourself against mosquito bites with repellents, mosquito nets and clothing covering arms and legs. We recommend you make an appointment with your GP or a specialist for further information on this subject. You can import the following items in Tanzania without having to pay customs fees: 200 cigarettes, 50 cigars or 250g tobacco, 1 liter of liquor, 250 ml of perfume. You can photograph and film the scenery without limit. For people, it is important to seek their consent. The Tanzanian shilling (TSH) is the monetary unit. There are 500 notes, 1000, 2000, 5000 and 10,000 shillings. Parts 10, 20, 50, 100 and 200 shillings. Possible changes in major banks. MasterCard, American Express, Diners Club and Visa are accepted into the lodges. Traveler's checks in U.S. dollars can be exchanged at banks. The import and export of local and foreign currency is limited. Amounts in excess of U.S. $ 5,000 must be justified. The current exchange rate is 2000 EUR for 1 TSH, TSH and 1500 for 1 USD. For U.S. dollars, it is recommended to come with notes printed after 2004. Earlier notes are rejected in some places and changed at a lower rate in bureaux de change. 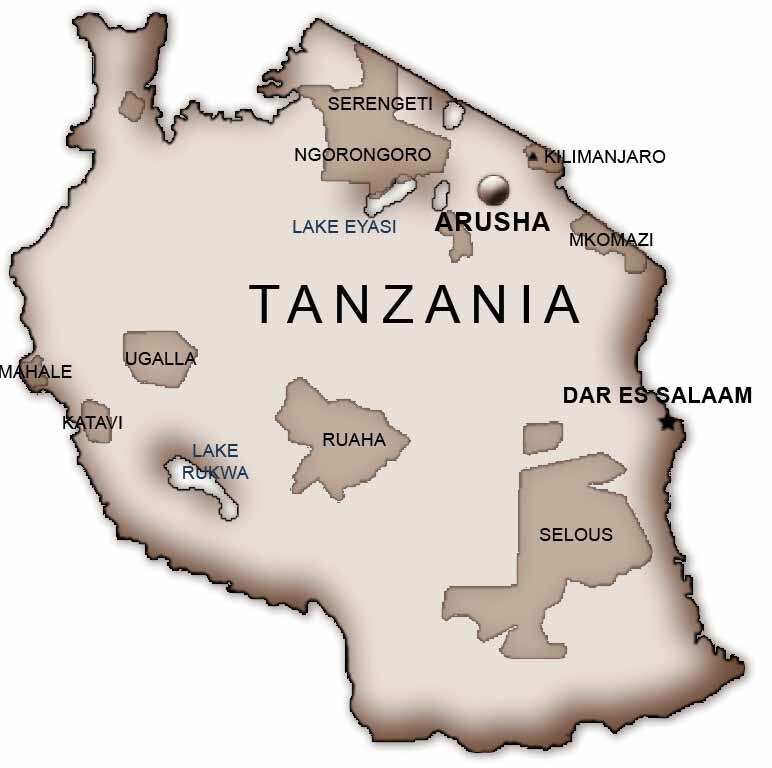 Tanzania is a country once under Anglo-Saxon influence, like all of East Africa and tipping is commonplace here. It is customary to tip in the various accommodation where you will be staying. Most lodges and camps have tip boxes at reception where you can leave between 5 and 10USD if you were satisfied with the service. The money is then shared among employees. Obviously there is no obligation to tip everywhere. Park employees or local guides can also be paid, but in all cases this must reflect a true service and not a mandatory "tax". For your safari accompanying team, it is also customary to tip at the end of the trip. Overall we recommend around 20USD to 15USD per day of safari between your guide and your cook, if you take a camping safari. Again, there is no obligation and the amount is left to your discretion. Haggling : it is in the curio (souvenir) shops that you will experience the delights of shopping. Bargaining is advised, but in the best shops that offer a quality guarantee, the margin for maneuver is limited. You'll also have opportunities outside the major cities, particularly in the curios of the Masai country. Crafts : The quality of work of artisans in Eastern Africa is undeniable. Be, however, under no illusions about the supposed authenticity of documents that will be presented. Worse yet, beware of hawkers who offers jewelry made of ivory or made from the body of a wild animal, such as bracelets called elephant hair. This trade is strictly prohibited in Tanzania and risks of buying pure junk are extremely high. Souvenirs : if you love bringing back souvenirs, you will not find it hard to find your happiness. The carvings are beautiful. The jewelry of semi-precious stones (malachite, tanzanite and tsavorite especially) are often very beautiful; beautiful solitaire games made of all different stones are found everywhere. You can also bring great animal sculptures in soapstone and colorful fabrics. 220 and 230 volts, 50 Hz. Power outages are fairly common. The sockets are UK type. We advise you to bring before leaving, an adapter for your electrical appliances in case of doubt. We recommend you bring a torch for your stay. You can buy stamps at post offices and receptions of international class hotels. A stamp for Europe costs 600 TSH (0.5 €). A letter takes about 10 days to reach Europe. The cost of an international call is very high. Find out from your operator before you leave. 3 hours compared to UK (GMT + 3) in winter, 2 hours in summer. Nights can be quite cold, betweeen -5 and 5°C (41°F and 23°F), and humid at 3,000 m (9850 ft) altitude, and between -5 and -20°C (23°F and -4°F) on the night of the final ascent between 4,600 m and 5,895 m (15,100 ft and 19,340 ft) altitude. The days are usually mild, generally dry except below 3,000 m (9,850 ft). A sleeping bag (grade -15°c to -25°c), sarcophagus or with side zip. Jumpers, warm trousers, Goretex under trousers – do not hesitate : IT IS COLD ! Wooly hat, hood, hat, gloves (silk + muffles). Personal Medicines bag (analgesic, eye drops, Vitamin C, foot care, high protection sun creams for the face and the lips, hydrating cream, anti-mosquito cream or spray, anti-diarrhea, intestinal antisceptic, wide spectrum antibiotics, disinfectant, plasters, elastic sticky band). Hydrochlonazone (water purification kits), pens (for presents). Altitude sickness remedies (Paracetamol, analgesic, vitamin C, etc…). During the climb, your bag will be placed in a waterproof over-bag, and carried by a porter. It must not weigh more than 12kg (the bags are weighed by rangers at the park entrance). You can leave us a bag that will be kept safely in our offices during the climb and we will return it when you when you come back down. During the day, you will only carry your day things inside a small backpack. Our Kili climbs are supervised by a team of local men, who have been specially trained and who are very experienced for this ascent. We also supply a decompression chamber. As soon as you feel out of breath, stop and breathe until you feel better. Once your heartbeat has come back to normal, you can continue. Take regular breaks, and use the time to admire the view. If you feel worse, with headaches, nausea, extreme fatigue, and appetite loss, you may have to come down or stay where you are. In any case, your guide is there to help. Don’t hesitate to let him know about any problem you may have… Importantly, do not worry about being left behind, don’t be afraid of stopping, adjust your breathing to your walking pace, instead of wanting to keep up with others, who may be better trained or fitter. Drink a lot (3 to 5 l of water a day). And above all, walking at your own pace is the key to your successful climb. Our guides, assistants and porters are specially trained to keep a close eye on you and to react at the earliest sign. Trust them and listen to their advice. Do not feel like going beyond your strength if they advise you to stop for a while. They are experienced and know exactly how to react when faced with problems. Il est préférable de vous munir de cartes mémoire en partant de France. Munissez-vous de piles et de batteries (3 minimums) car il est impossible de trouver des prises pour recharger les appareils photo ou caméscopes pendant l’ascension. Airlines sometimes forget luggage, which are found and forwarded later on. It is therefore important to carry with you the important equipment you will need in the beginning of the climb: shoes, jacket, fleece, sleeping bag, sunglasses, gloves. As soon as the rest of the luggage is received, we forward it immediately with a porter. In case you lose your papers, we advise you to keep a copy in a separate location from the originals.